That was me, the guy begging money for a bottle of wine and a fifty-cent bed in a flophouse. 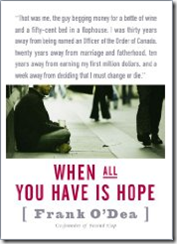 I was thirty years away from being named an Officer of the Order of Canada, twenty years away from marriage and fatherhood, ten years away from earning my first million dollars, and a week away from deciding that I must change or die. Unfortunately, as much as the author (Frank O’Dea) and publisher tried to make clear what this book was about, I’m sure many readers (including myself) focussed on that small bit of text at the bottom. In a world where corporate-world authors like Trump focus on their businesses successes, maybe it wasn’t such a stretch to assume this book would be the same: Frank picked himself up, co-founded a successful coffee chain, and the book would be almost entirely based on his experiences in setting up and running Second Cup. Well let me state emphatically dear reader that this is *not* what this book is about. In fact his time with Second Cup takes only 32 pages of the 222 page book. I’ll admit that, having bought this book in the business section, I was a little bewildered at the course the narrative took. In fact after finishing it and digesting what I had read, I felt it was a disservice to Frank to have his Second Cup involvement feature so prominently on the cover, and why this was even in the business section to begin with. This book is not the story of a businessman, it’s the story of a man who ran businesses among other aspects of his life. Those looking for insight into how to run a successful business from the ground up would do better to look elsewhere, that’s not what’s trying to be communicated. The book spans three distinct time periods in Frank’s life. Pages 1 – 74 detail his childhood, his adolescence and entering adulthood. He walks us through life changing events involving his family, sexual abuse, and alcoholism that eventually brought him to live on the streets. Pages 75 – 168 cover the business years, and not just at Second Cup. Frank was involved with many different businesses and political endeavours while dealing with leaving the company he co-founded, having his parents pass away, finding and holding on to love, and dealing with feelings and issues anchored in his past but revived in new experiences. Pages 169 – 222 move into a new phase of Frank’s life: charity work, global causes, realizing the importance of being involved and giving back. In a speech he gave to the graduating class of Royal Roads University, he said “It’s not the money you make that matters most. It’s the difference you make.”; a fitting quote that speaks to the entirety of the book. There were times reading the book that I was frustrated. During the course of his life Frank was sexually abused four times, yet I seemed to have more of an emotional response reading about them then was communicated through the book. Perhaps that’s due to what Frank was feeling as he lived through an alcohol-induced fog for so much of his life though, numbed to the severity of what was happening to him. It’s interesting to note that the more emotionally charged areas of the book seem to come after he became sober and dealing with his business partners and family. Not all books we read to gather experience need to be topical, focussed on experiences in business or finance, telling stories from the boardroom and the sales floor. Business is a means for us to live, its a facet of our lives but it should never become our lives. Business is a means to an end, a payoff whether it be monetary or whether that business is in charity work for the betterment of street kids. Frank O’Dea’s story speaks to that, but it also speaks to something else. 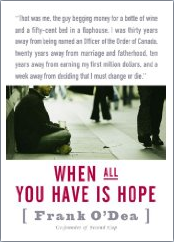 He entitled the book “When all you have is hope”, but I think a more apt title is “When you realize you have power.” Frank turned his life around on his own. He even admits that the moment he realized that he had to get off the street it wasn’t any big, emotional, spiritual experience. It was matter of fact. It was practical. And then, he acted on that. That’s what I loved about this book. It’s not a rags to riches story. It’s a rags to riches to realization to giving back & finding happiness story. And really, its one that any of us could claim as our own if we wanted to.